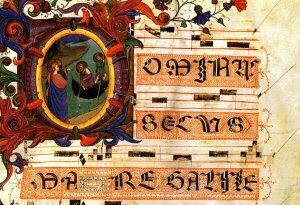 This is an historiated capital O, an initial in the The San Domenico Missal. Fra Angelico made the illustrations in that missal while working in the convent of San Domenico in Fiesole, near Florence. 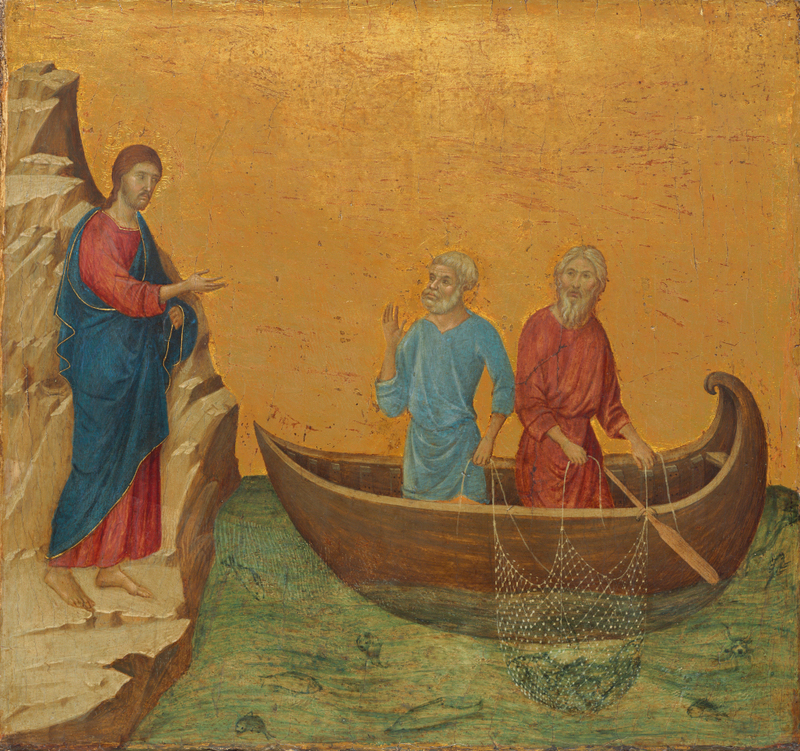 Depicted is the moment Jesus calls the fishermen Peter and Andrew. The shoreline and the lake that vanish into the horizon behind them help to create a strong suggestion of depth in this tiny picture. A beardless Jesus gestures Peter (who was still called Simon at the time) and his brother Andrew to follow him: "Come ye after me, and I will make you to become fishers of men". According to the gospel Peter and Andrew were out fishing on the lake when they were called. Caravaggio gives his own interpretation. 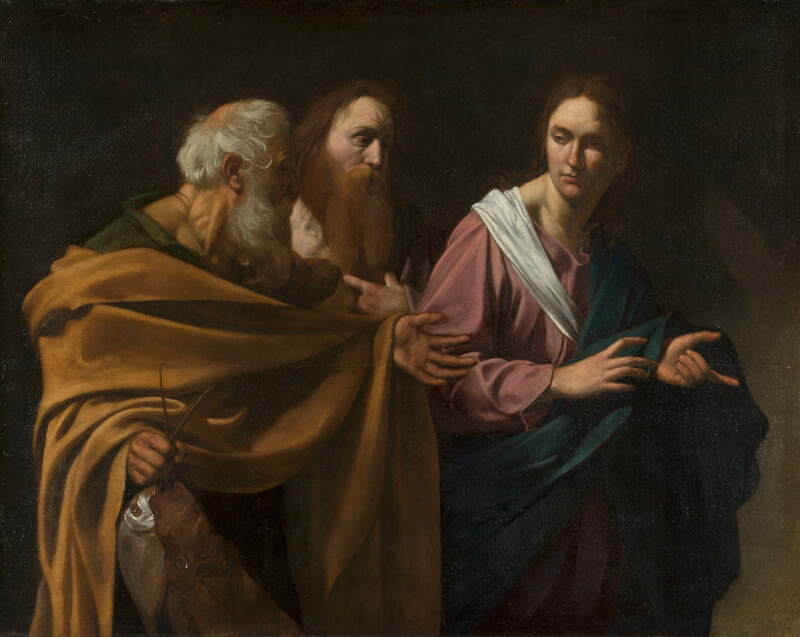 Because of his prominence, the man on the left is thought to be Peter. It is only since 2006 that this painting is attributed to Caravaggio. It was long thought to be a copy of the lost original. A thorough cleaning operation revealed new details that pointed to the Italian master. The work was acquired by the English king Charles I in 1637; it was the discovery of the bill of sale that led art historians to this painting in the Royal Collection. One of the details that shows this work must be the original is a carving in the ground layer under Peter's ear. Caravaggio often used such incissions, and they are very uncommon in copies. This fresco on the northern wall of the Sistine chapel shows two events. The calling of Peter and Andrew, the Jesus' first followers, is shown in two scenes. In the background on the left, Jesus calls them while they are setting out a net in the Sea of Galilee, as described in the Bible. The calling is repeated in the foreground, this time before a large audience. 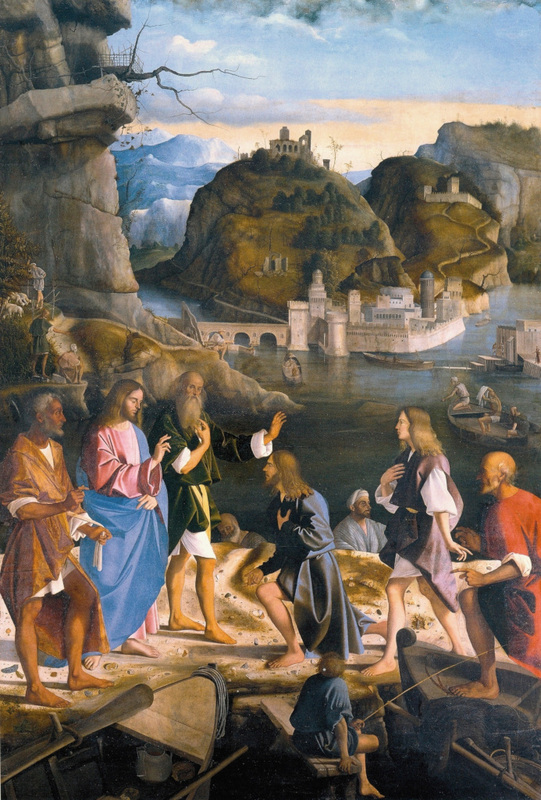 In the background on the right, Peter and Andrew stand behind Jesus as he calls two other fishermen. They are the brothers James and John, who are fishing with their father. The figures in the foreground on the right are important citizens of Florence: bankers, traders and scientists. 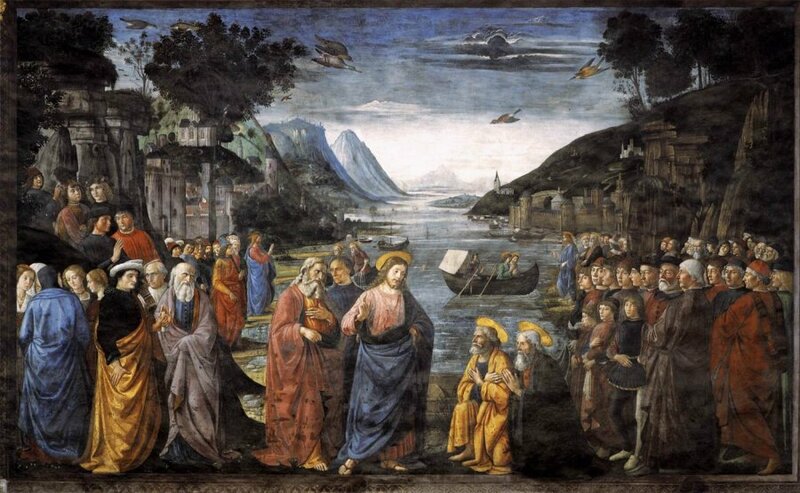 As he did in other works, Ghirlandaio applies his technical skills to the full. The lighter colors in the background suggest remoteness. The mountains on the left form a line drawing the spectator's eye to the first scene.